General Birds-Eye View of Washington and the Vicinity, Showing the Forts, Camps, Railroads, Rivers, etc. 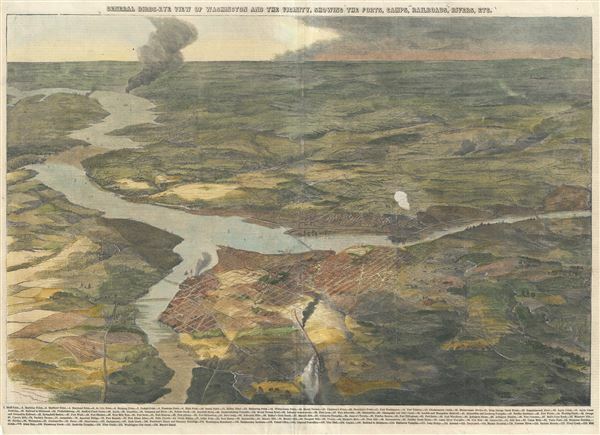 This is a stunning 1862 birds-eye view map or view of Washington D. C. and vicinity issued in the January 4, 1862 edition of Harper's Weekly. This view offers a fascinating snapshot of the nation's capitol shortly after the outbreak of the American Civil War. The view captures Washington looking southward from around Mayfair towards Warrenton and beyond. The map shows the capital and its vicinity in considerable detail. Streets, railroads, parks, rivers, forts, camps, bridges and important buildings are noted throughout with a legend along the bottom of the view. Some of these include Bluff Point, Mount Vernon, Fort Washington, Alexandria, Hunting Creek, Aqueduct Bridge, Little Falls, Prospect Hill, Navy Yard, Washington Monument, City Hall, Capitol, President's House (former name for the White House) etc. This view was issued as part of the January 4, 1862 edition of Harper's Weekly, with part of Charles Dickens' new Christmas Stories appearing on verso. Harper's Weekly, Jan 4, 1862, p. 8-9. Very good. Minor wear and toning along original centerfold. Minor spotting and edge wear. Text on verso. Princeton University Library, Graphic Arts Collection, GA 2008.01672.